Lock in a great price for Harris House by the Beach – rated 8.6 by recent guests! Parking right outside the room. Close proximity to the boardwalk. Friendly staff. Clean room. No issues. The pool was enjoyable! Everything was well cared for. So close to beach and boardwalk. Front desk staff were very helpful and friendly. Coffee was good, beds comfortable, location couldn't be better. Great location for a fair price, steps away from the board walk and great services. Loved the pool, the staff we so sweet, and Michael was very helpful with a minor problem. Plus only 1/4 of a block to board walk. 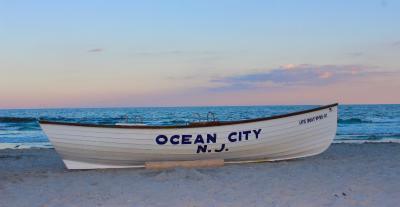 The beds were very comfortable, Great location- close to beach and boardwalk. Heated pool was great for the family since we had a cooler weekend with rain. The rooms were clean and neat. The motel was so clean. The location was perfect. The staff were the nicest people. Very close to the boardwalk, and good location overall. On-site parking was a big plus, as was the heated pool. Morning coffee was wonderful. Perfect location! We were right behind the Boardwalk so walked to everything — beach, bike rentals, food. We didn’t actually move our car until we checked out! Location was excellent. Staff was nice. Room was clean. Showers after beach were great and that you let us come any time for arriving - with beach passes and parking - was great! Harris House by the Beach This rating is a reflection of how the property compares to the industry standard when it comes to price, facilities and services available. It's based on a self-evaluation by the property. Use this rating to help choose your stay! 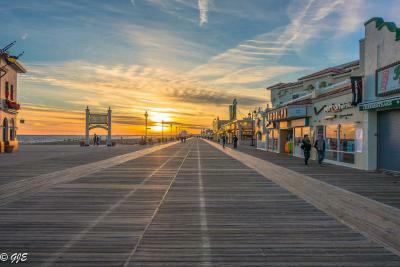 Harris House Motel is set in Ocean City, 200 feet from the Boardwalk and the beach. The rooms come with a flat-screen TV with satellite channels. All rooms include a seating area to relax in after a busy day. Every room includes a private bathroom. For your comfort, you will find free toiletries and a hair dryer. You will find a 24-hour front desk at the property. Guests will also get 1 complimentary parking spot per room and free beach passes. There is a bike rental nearby. Atlantic City International Airport is 16 mi from the property. When would you like to stay at Harris House by the Beach? This quadruple room features 2 queen beds, a microwave, seating area and air conditioning. Please note, a rollaway bed can be added to this room. 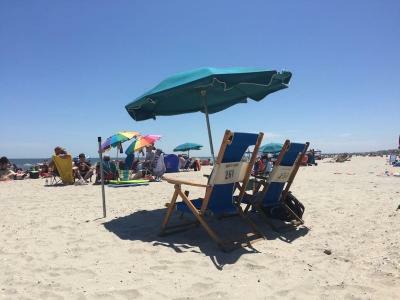 Situated literally steps away from one of the best beaches in America, guests at The Harris House enjoy the ability to walk outside of their rooms and be at the surf and sand in just seconds. Our ultra-clean motel also features the largest heated swimming pool in town, free parking for every single room, free beach tags so you don't have to buy them down at the beach, and unparalleled customer service. In addition we offer all-day use of our amenities on day of arrival and departure, including use of our guest changing rooms and showers after check-out. 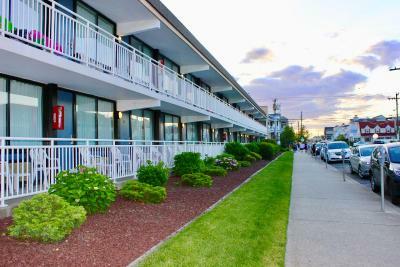 Consistently ranked as a top 5 motel in Ocean City, the Harris House is the ultimate vacation destination if you are looking for an unbeatable location beside the boardwalk, clean rooms, and top-tier hospitality. House Rules Harris House by the Beach takes special requests – add in the next step! Harris House by the Beach accepts these cards and reserves the right to temporarily hold an amount prior to arrival. Please note that guests must be 21 years or older to make a reservation at Harris House Motel. The guest whose name is on the reservation must be occupying the room. Please note, this property does not have an elevator and is 2 stories. Please note, the pool is not handicap accessible. The weather did not accommodate our stay at Harris House. Little noisy in the early am from deliveries to boardwalk. Great Location, next to boardwalk !!! The WiFi was very slow. Our room was quite tight for 4 adults. Would have loved in room coffee (Kurig) Hard to carry luggage up to room through pool security gates. Sink water faucet was very hard to turn on. Most pillows need replaced. Bathroom door was hard to close. Maybe the pool should be open longer in the evenings. Too much fluctuation in price of room! The walls are too thin. We could hear every conversation the room next to us had. Also very loud if your room faces ocean Avenue. The lady who checked us in and out did not greet Us, wish us to have a good stay, and at checkout took our key cards and that was it. Maybe she was having a bad two days, but it's nice to be greeted with a welcome to Ocean City and have a safe trip home when you check out. The mattresses were very comfortable, even for my sister who has chronic back pain. The room was very clean. No elevator. We were on 2nd floor and steps were hard for grandparents. Would have liked a little more space in the room. I enjoyed the tea since I didn't think the coffee had any flavor. Could have use more towels at the pool. But some folk took more than they needed.